The Free Syria Army warned Israel on Sunday against interfering in the civil war which has been ravaging Syria since March 2011. A report by Turkey's Anadolu news Agency quoted a statement issued by the FSA saying that Israel's rocket fire at Syria on Sunday afternoon was aimed to help the Assad regime in his war against opposition forces. Clashed between Damascus forces and the rebels have been edging closer to the Israeli border for weeks. Several mortar shell fired as part of the clashes have landed on Israeli soil as a result. Sunday morning saw a 120mm mortar shell hit the eastern Golan Heights, prompting the IDF to return fire for first time since the 1973 Yom Kippur War. The missile fired by the IDF was an advanced Tammuz missile, an advanced electro-optic missile, based on Spike long-range missile technology. "Israel assisted Assad's criminal regime by firing at FSA forces that were closing in on Damascus forces and negotiating their surrender," the Free Syria Army statement said. "The Israeli forces interfered with the intent of saving Assad's force by delivering a direct hit to the rebels and breaking their siege over Assad's criminal forces." The statement repeatedly warned "the Israeli enemy against any interference in the Syrian conflict in favor of Assad's regime. "Any artificial tension created by Israel in the occupied Golan Heights is an attempt to assist Assad's regime by distracting the Syrian people from their revolution," the statement said. 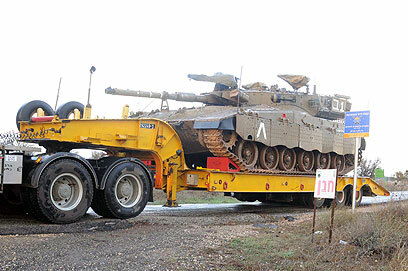 Last week, three Syrian tanks entered the demilitarized zone in the Golan Heights, while pursing rebel forces. A senior member of the Syrian opposition told one of the resistance's media outlets that Israel not only allowed the tank to enter the restricted buffer zone, but also assisted them by sending up flares to illuminate the area and ease their mission. He further claimed the UNIFIL forces stationed in the demilitarized zone were assisting Assad's forces. These claims have not been corroborated or reiterated by any other source. See all talkbacks "Rebels warn Israel against Syria interference "